Description: Drawing on the most recent, groundbreaking archaeological research, Eric M. Meyers and Mark A. Chancey re-narrate the history of ancient Palestine in this richly illustrated and expertly integrated book. Spanning from the conquest of Alexander the Great in the fourth century BCE until the reign of the Roman emperor Constantine in the fourth century CE, they synthesize archaeological evidence with ancient literary sources (including the Bible) to offer a sustained overview of the tumultuous intellectual and religious changes that impacted world history during the Greco-Roman period. The authors demonstrate how the transformation of the ancient Near East under the influence of the Greeks and then the Romans led to foundational changes in both the material and intellectual worlds of the Levant. Palestine's subjection to Hellenistic kingdoms, its rule by the Hasmonean and Herodian dynasties, the two disastrous Jewish revolts against Rome, and its full incorporation into the Roman Empire provide a background for the emergence of Christianity. The authors observe in the archaeological record how Judaism and Christianity were virtually undistinguishable for centuries, until the rise of imperial Christianity with Emperor Constantine. The only book-length overview available that focuses on the archaeology of Palestine in this period, this comprehensive and powerfully illuminating work sheds new light on the lands of the Bible. 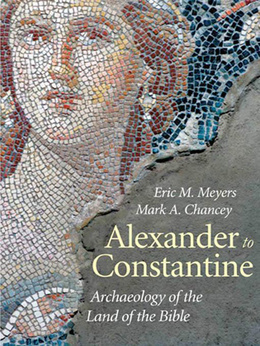 Citation: Lee M. Jefferson, review of Eric M. Meyers and Mark A. Chancey, Alexander to Constantine: Archaeology of the Land of the Bible, Review of Biblical Literature [http://www.bookreviews.org] (2014).